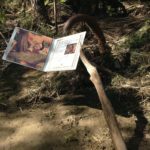 A design and production company that embraces graphic, architectural, landscape, and industrial design. 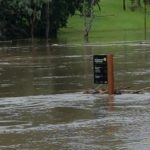 The recent major storms to hit South Australia created major flooding in Bonython Park (the home of the Bunyip). 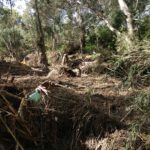 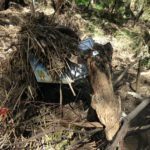 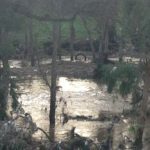 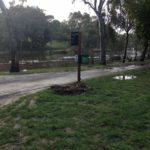 As part of our design brief it was to take into consideration flooding that may cause debris washing down through the River Torrens, but who would have ever predicted the major flooding that we witnessed. 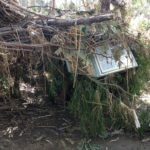 The photos show the extent of the flooding and debris washed up over our signage, but I am glad to report that no major damage has been caused. 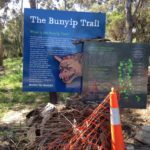 This proves with clever design and with the correct choice of materials that the Bunyip Trail and our wayfinding signage lives to see another day. 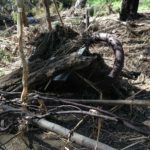 Copyright © 2018 Ecept All Rights Reserved.